North of N.H. Route 123A, two miles north of Alstead Village in Langdon. The bridge is 81'0" long with a clear span of 76'0". It has an overall width of 16'6" with a roadway width of 12'1" and a maximum vertical clearance of 11'1". It is braced by cables attached to the new highway bridge which bypassed it in 1964. It is now used for foot traffic only. Three bridges previously stood on this site. They were built in 1790, 1814, and 1840 and were all of the pole and plank type. The current bridge, built in 1869, was of a type patented by Sanford Granger in 1833. The patent appears to be a modification of the Town lattice truss. Sandford Granger owned a sawmill on Fall Mountain Brook from 1838 until 1851. Virgin timber removed from the mountain was used in the construction of his bridges. The current structure was built by his son Albert S. Granger. In 1961, an estimate of $7,000 was given to the town for the restoration of the bridge. The town was to pay $2,100 and the state $4,900. However, the town decided to establish a sinking fund to pay for building a modern bridge which was built downstream in 1964 under the Town Bridge Aid Program. 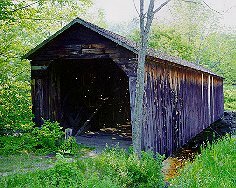 The covered bridge was closed to vehicular traffic and retained for historic reasons. The structure is also known as the Cold River Bridge. The McDermott Bridge is listed on the National Register of Historic Places.